Longevity Vitality Essential Oil is a very powerful antioxidant support oil blend that helps to neutralize free radicals*. The ORAC value of this oil is 1,500,000 µTE/100g. That is greater than any food or single essential oil that has been recorded! There are many schools of thought on this, but we do know that the oxidative stress or free radical theory is one of the strongest. The theory is based on the fact that continued oxidative stress to cells, receptors and DNA in the body cause aging; beyond the normal aging process. All of us are subject to day-to-day oxidative damage. The good news is one of the best ways we can decrease the amount of oxidative stress is by increasing our uptake of antioxidants. ORAC tells you the antioxidant capacity of a food item. This was developed by the USDA researchers at Tufts University in Boston. This is the only test that measures the degree of free-radical inhibition of a food item! Most of us think that berries such as blueberries and strawberries have high antioxidant values; however, most essential oils knock the food values out of the ballpark! Wow! So now you can see that the value for Longevity essential oil (and Clove) is HUGE!!! So much for making sure you are eating your carrots and taking your vitamins every single day! Switch that motto to – Are you taking your daily essential oils? Young Living who produces Longevity essential oil believes that taking an antioxidant supplement is so important that it should be taken everyday. And, as such, they make it available as a Dietary Supplement for easier consumption. Antioxidants may protect the skin by attaching themselves to free radicals, which minimizes the potential harmful effects and is important for youthful-looking skin*. I take at least one Longevity Softgel daily or one capsule with 3-4 drops of longevity. More if I am stressed or if I am doing a lot of computer work. Or anything extra challenging that is out of your norm. This is an easy reference guide for Longevity Vitality Essential Oil Blend. It will tell you how to use your oil blend and what to use it for. It will also provide you with some fun tips and testimonials! Want to Purchase Therapeutic Longevity Vitality Essential Oil? Go to the Oil Shop! Buy Longevity Vitality Oil Here! What is in Longevity Vitality Essential Oil? There are four therapeutic grade essential oils in Longevity essential oil. They are listed below along with a brief description of each oil. Frankincense Essential Oil (Boswellia carteri) iis high in sesquiterpenes which helps to uplift spirits and promotes relaxation (overcome stress). Looking for an EASY way to Take Longevity Daily? Take Longevity daily in a softgel! The Longevity Softgels are enteric coated and have an ORAC value of 150,000 µTE/100g. The value is slightly lower than the pure essential oil because it also contains some additional vegetable oils, but easier to take and same great benefits! Very high ORAC for an antioxidant supplement! The other ingredients are: Fractionated Coconut Oil (distilled from pure coconut oil), gelatin, glycerin, enteric coating solution and mixed tocopherols (compounds of which many have Vitamin E activity). 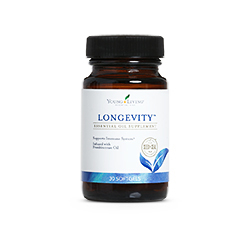 To purchase Longevity Softgel Supplement, go to The Oil Shop! What are the Documented Uses for Longevity Vitality Essential Oil? Antioxidant support, supports healthy immune system and lifestyle*. Want to Learn about Longevity's Emotional, Spiritual and Other Aspects? Then check out the longevity essential oil page for this information! 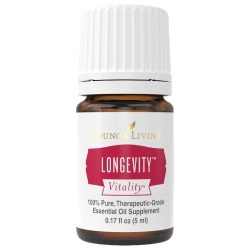 How do I use Longevity Vitality Essential Oil? Dietary Supplement: place several drops in capsule with olive oil and take internally. If you prefer dilution, use at least 50:50 dilution-one part essential oil: one part vegetable oil. Can this oil be used for Animals? Yes, absolutely! Note about Animals: Certain oils can be very toxic to cats. Citrus and pine products and oils in particular if not of therapeutic grade! Please consult your vet if you are not sure about applying any essential oil to your pet. What are the Safety Precautions? Children under 5 years of age should not use use Longevity essential oil. Can cause irritation to the skin, therefore dilution is necessary. Repeated use many result in contact sensitization. Avoid direct sunlight for 3-6 hours after applying to skin.